California 284 travels from Chilcoot north to Frenchman Lake, which was formed in 1961 as part of the State Water Project.1 Photo taken 09/04/10. California 284 is Frenchman Lake Road. The state route leads about eight miles north from California 70 at Chilcoot to the recreation area at Frenchman Lake. The highway slowly ascends from the unincorporated community through Little Last Chance Canyon into the Plumas National Forest and the Frenchman Reservoir State Recreation Area. California 284 starts out relatively straight in the Sierra Valley, but it quickly becomes winding and narrow. Photo taken 01/20/03. The lone reassurance marker route for California 284 north appears as the highway heads out of Chilcoot. Photo taken 09/04/10. Ranch homes are scattered on both sides of California 284 it leaves Chilcoot. Photo taken 09/04/10. California 284 proceeds through the northern reaches of the Sierra Valley as it approaches the Diamond Mountains. Frenchman Lake is nestled inside the mountains. Photos taken 09/04/10. Upon reaching the foothills, the state route curves with the terrain and enters Plumas National Forest. Photos taken 09/04/10. California 284 navigates through the Little Last Chance Canyon and gains elevation to southern reaches of Frenchman Lake. Photos taken 09/04/10. California 284 ends at the transition to Forest Service Route 11 by Frenchman Lake. Photo taken 01/20/03. An access road crosses the dam, joining Forest Service Route 11 with a small parking area that overlooks Frenchman Lake. Photo taken 09/04/10. State maintenance ends and Forest Service Route 11 begins just beyond the dam road intersection. Photo taken 09/04/10. Leaving Frenchman Lake. California 284 begins and descends into Little Lost Chance Canyon. Photo taken 09/04/10. Second photo taken 01/20/03. California 284 sees several sheer cliff walls along the course through Little Last Chance Canyon, Photo taken 09/04/10. Emerging from the narrowest portion of Little Last Chance Canyon, California 284 pushes south toward Chilcoot. Photos taken 09/04/10. California 284 ventures southward from Plumas National Forest through northern reaches of the Sierra Valley. Photos taken 09/04/10. California 284 reaches the unincorporated community of Chilcoot. Photo taken 09/04/10. Approaching the unmarked intersection with SR 70 (Feather River Highway) on SR 284 north. SR 70 heads east to Hallelujah Junction and U.S. 395 south to Reno, Nevada. Photo taken 09/04/10. West from the north end of SR 284, SR 70 continues to SR 49 south, Portola and Quincy. Photo taken 09/04/10. A narrow road connects California 284 with a small parking area on the southeastern corner of the Frenchman Lake. A spillway flows into Little Last Chance Canyon from nearby. Photos taken 09/04/10. A monument/plaque appears at the parking area on the southeast corner of. Formed along Little Last Chance Creek, when full the reservoir sits at an elevation of 5,588 feet above sea level. Construction on the dam was completed in 1961 as part of the California State Water Project.1 Photos taken 09/04/10. 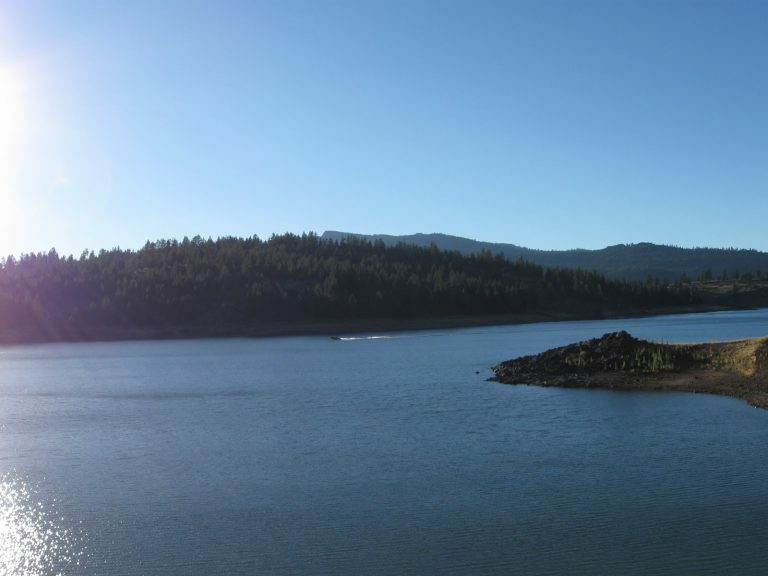 Frenchman Lake is administered as part of the Plumas National Forest with recreational activities including camping, boating and hiking. Photo taken 09/04/10.